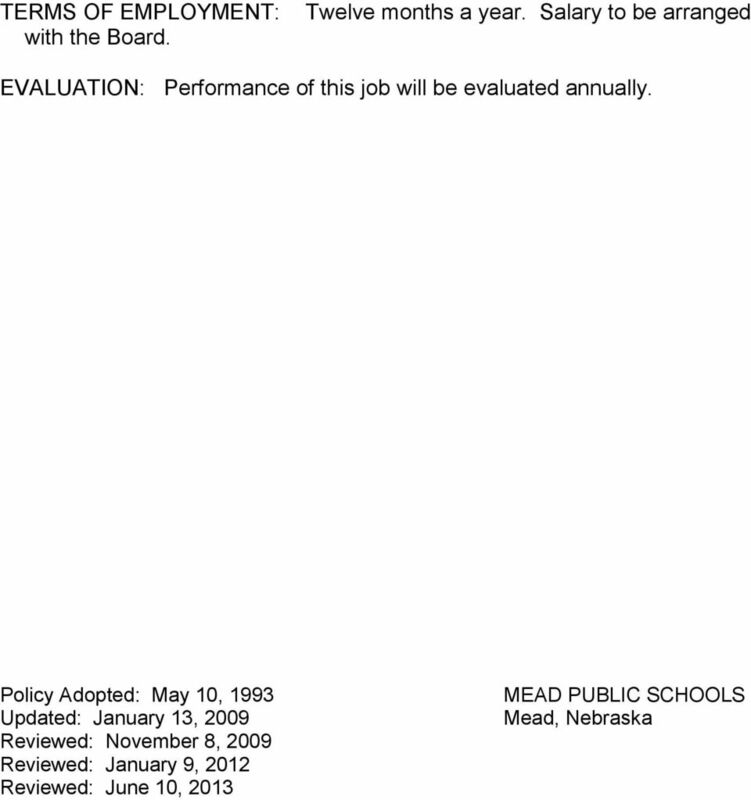 Download "2000 Board of Education. 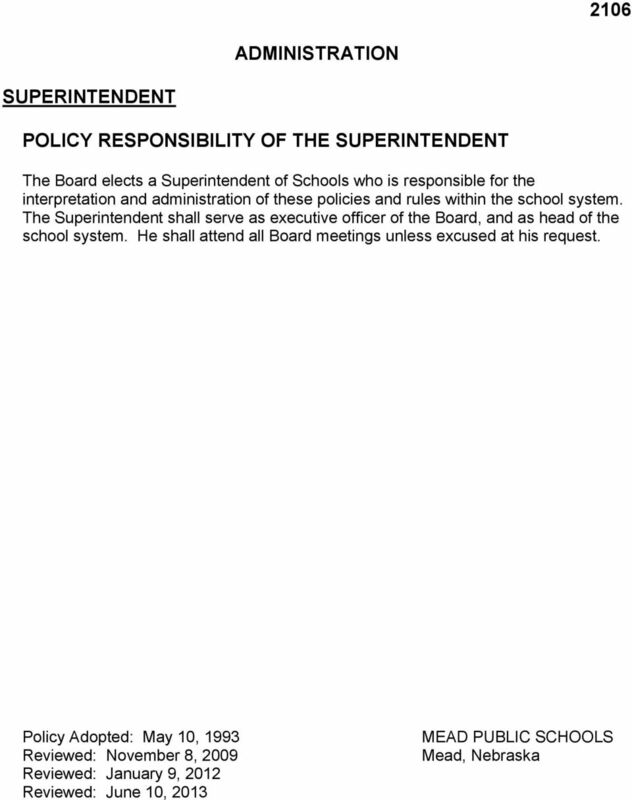 2106 Superintendent Responsibility. 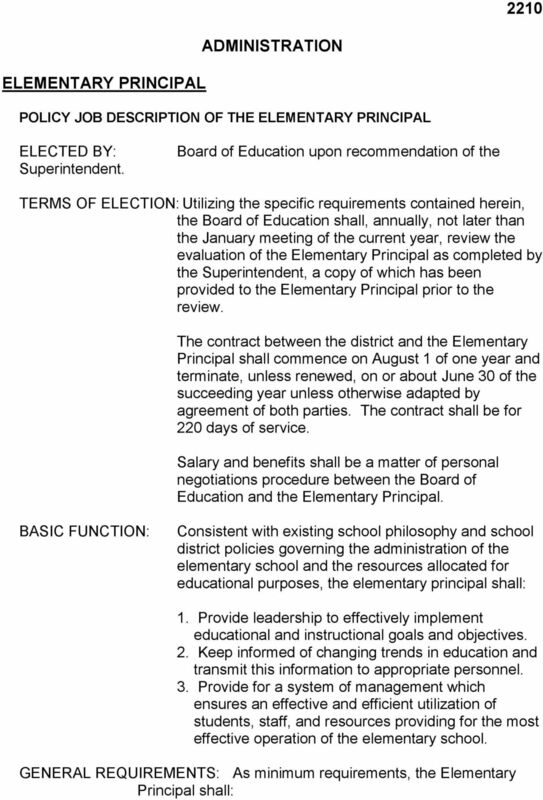 2107 Superintendent Job Description. 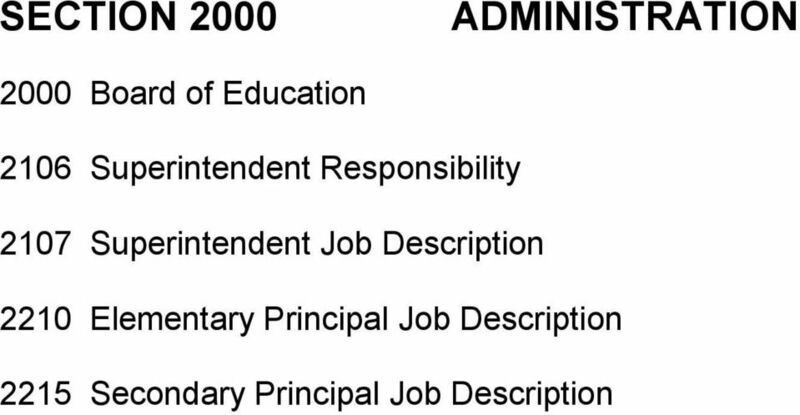 2210 Elementary Principal Job Description"
4 2107 ADMINISTRATION SUPERINTENDENT POLICY JOB DESCRIPTION OF THE SUPERINTENDENT TITLE: SUPERINTENDENT OF SCHOOLS QUALIFICATIONS: 1. Experience in teaching and school administration totaling at least 10 years. 2. An earned specialist degree with a major in educational administration. 3. 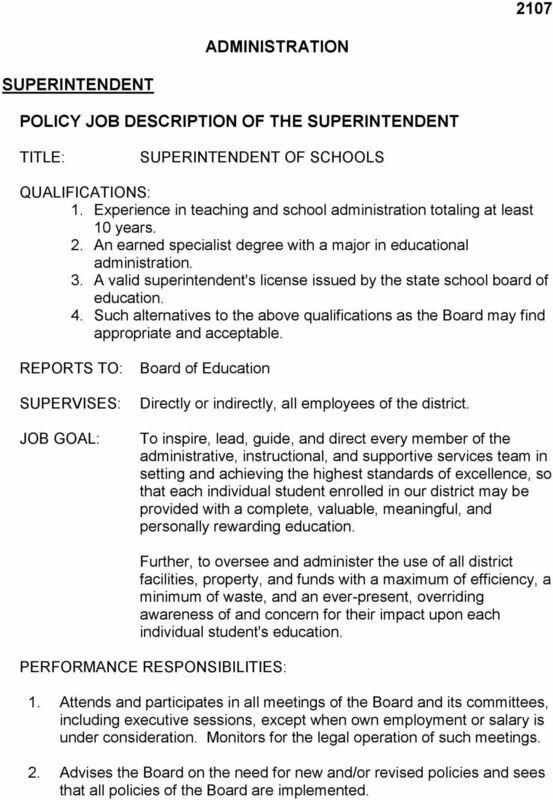 A valid superintendent's license issued by the state school board of education. 4. Such alternatives to the above qualifications as the Board may find appropriate and acceptable. 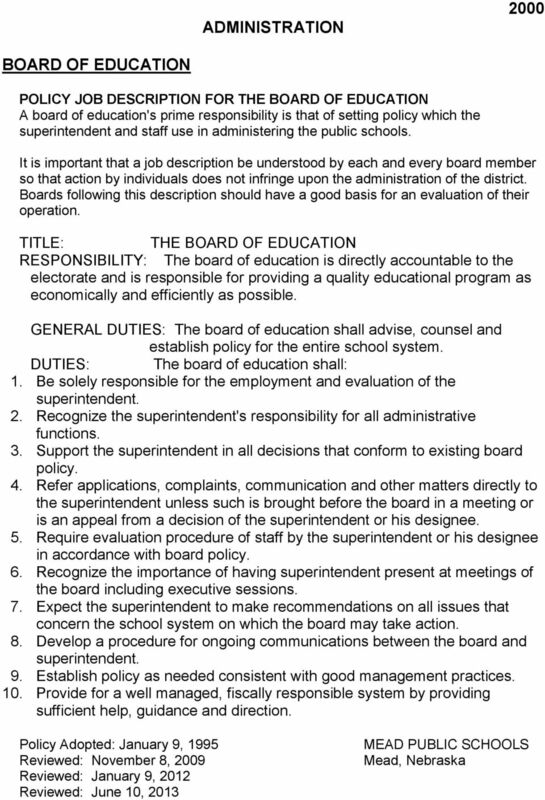 REPORTS TO: SUPERVISES: JOB GOAL: Board of Education Directly or indirectly, all employees of the district. To inspire, lead, guide, and direct every member of the administrative, instructional, and supportive services team in setting and achieving the highest standards of excellence, so that each individual student enrolled in our district may be provided with a complete, valuable, meaningful, and personally rewarding education. Further, to oversee and administer the use of all district facilities, property, and funds with a maximum of efficiency, a minimum of waste, and an ever-present, overriding awareness of and concern for their impact upon each individual student's education. PERFORMANCE RESPONSIBILITIES: 1. Attends and participates in all meetings of the Board and its committees, including executive sessions, except when own employment or salary is under consideration. Monitors for the legal operation of such meetings. 2. 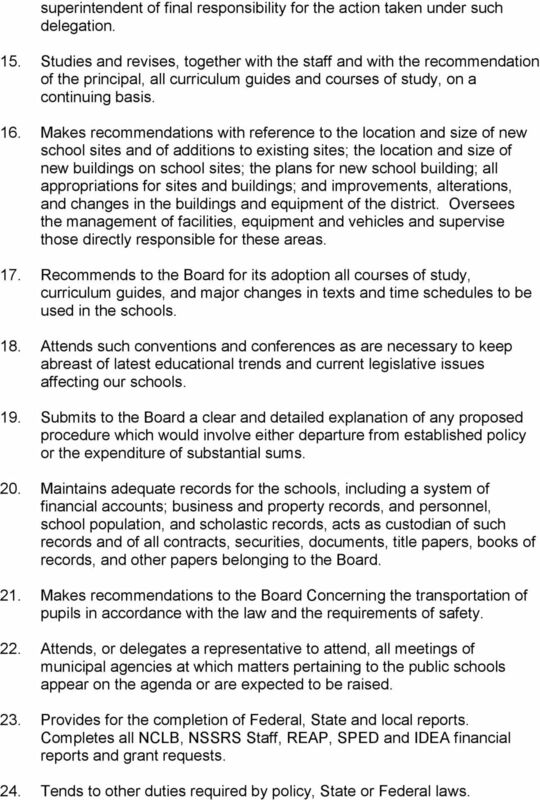 Advises the Board on the need for new and/or revised policies and sees that all policies of the Board are implemented. 6 superintendent of final responsibility for the action taken under such delegation. 15. Studies and revises, together with the staff and with the recommendation of the principal, all curriculum guides and courses of study, on a continuing basis. 16. Makes recommendations with reference to the location and size of new school sites and of additions to existing sites; the location and size of new buildings on school sites; the plans for new school building; all appropriations for sites and buildings; and improvements, alterations, and changes in the buildings and equipment of the district. Oversees the management of facilities, equipment and vehicles and supervise those directly responsible for these areas. 17. Recommends to the Board for its adoption all courses of study, curriculum guides, and major changes in texts and time schedules to be used in the schools. 18. Attends such conventions and conferences as are necessary to keep abreast of latest educational trends and current legislative issues affecting our schools. 19. Submits to the Board a clear and detailed explanation of any proposed procedure which would involve either departure from established policy or the expenditure of substantial sums. 20. Maintains adequate records for the schools, including a system of financial accounts; business and property records, and personnel, school population, and scholastic records, acts as custodian of such records and of all contracts, securities, documents, title papers, books of records, and other papers belonging to the Board. 21. Makes recommendations to the Board Concerning the transportation of pupils in accordance with the law and the requirements of safety. 22. Attends, or delegates a representative to attend, all meetings of municipal agencies at which matters pertaining to the public schools appear on the agenda or are expected to be raised. 23. Provides for the completion of Federal, State and local reports. Completes all NCLB, NSSRS Staff, REAP, SPED and IDEA financial reports and grant requests. 24. Tends to other duties required by policy, State or Federal laws. 10 SPECIFIC RESPONSIBILITIES: A. 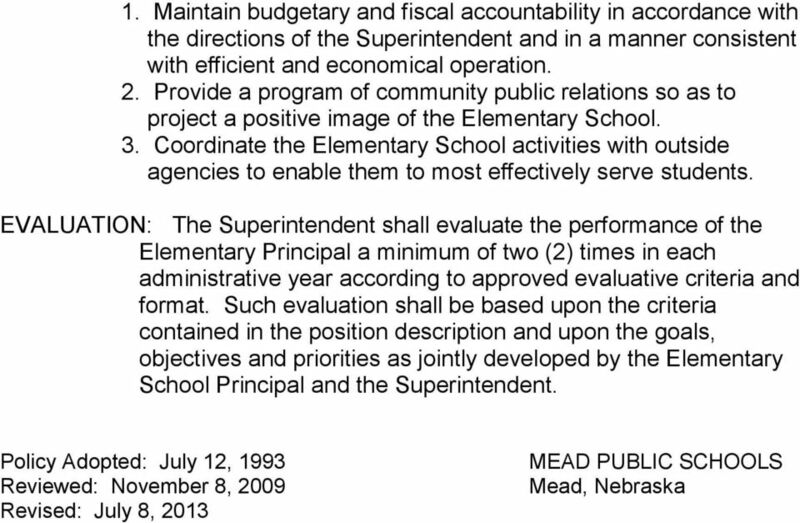 Board of Education development, in-service work, and the overall program of the school. 4. shall schedule all extra curricular activities with the activities director in order to avoid conflicts in scheduling. 1. Attends regular and special meetings of the Board of Education in a resource capacity unless excused by the superintendent. 2. Carries out the directions of the Board of Education in the most expeditious manner possible. B. Supervision 1. Students - The Elementary Principal shall: a) Establish an educational environment which facilitates maximum learning potential for each student. b) Maintain student records to ensure accuracy, completeness, and security as well as confidentiality. c) Establish and enforce reasonable rules and regulations, with approval of the Board of Education and the Superintendent, so as to effect the smooth operation of the elementary school. d) Encourage and provide for curricular study and revision as needed. e) Provide direction and means for the operation of those extra curricular activities as have been designated for the elementary school by the Board of Education. f) Ensure that materials, time and personnel have been provided for the Elementary Media Center so as to allow for the various needs of the students and staff. g) Direct such special education programs as have been established by the Board of Education in a manner which takes into account the special needs of all the children. 14 1. Have in force a valid Nebraska Administrative and Supervisory Certificate for grades Have obtained a Masters Degree in school administration with appropriate secondary (7-12) endorsement or a Masters Degree in secondary education with appropriate administrative endorsement from an accredited institution of higher learning. 3. Have necessary certification and experience qualifications to conform to current North Central Association accreditation standards for secondary principals. SPECIAL REQUIREMENTS: In order to perform in an effective manner, the secondary principal shall possess the following special requirements: 1. The ability to communicate and exhibit effective leadership potential to the students, staff, and the community. 2. A strong background in curriculum development and familiarity with state and federal reporting requirements and financial assistance programs. 3. Familiarity with laws, rules and regulations as they affect the operation of the secondary school. 4. The ability to effectively coordinate all of the educational and support services of the secondary school. RELATIONSHIPS: The Secondary Principal: 1. Shall report to and keep the Superintendent informed of all new developments, serious problems, and unusual situations involving the secondary school. 2. Shall report directly to the Board of Education through the regular board meeting reports as scheduled by the Superintendent. 3. Shall exchange information with the Elementary School Principal to coordinate efforts in curriculum development, in-service work, and the overall instructional program of the school. 4. Coordinates, in cooperation with the Activities Director, all secondary school activities. 15 SPECIFIC RESPONSIBILITIES: A. Board of Education 1. Attends regular and special meetings of the Board of Education in a resource capacity unless excused by the superintendent. 2. Carries out the directions of the Board of Education in the most expeditious manner possible. B. Supervision 1. Instruction - The Secondary Principal shall: a) Establish an educational environment which facilitates maximum learning potential for each student. b) Maintain student records to ensure accuracy, completeness, and security as well as confidentiality. c) Establish and enforce reasonable rules and regulations, with approval of the Board of Education and the Superintendent, so as to effect the smooth operation of the secondary school. d) Encourage and provide for curricular study and revision as needed. e) Ensure that materials, time and personnel have been provided for the Secondary Media Center so as to allow for the various needs of the students and staff. 2. 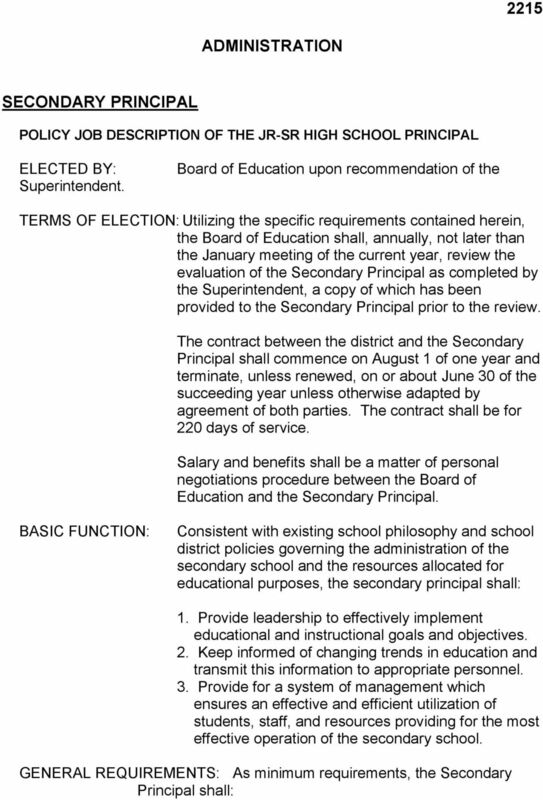 Professional Staff - The Secondary Principal shall: a) In cooperation with the Superintendent, screen, interview, evaluate, and select candidates for secondary professional positions. b) Recommend to the Superintendent those secondary teachers designated for selection, retention, dismissal, or reassignment. c) Evaluate, according to Board Policies, all members of the professional staff and provide, in writing, a summary of those evaluations. d) Provide guidance and direction to the professional staff on methods and means to encourage the improvement of instruction. e) Provide for programs 7-12 for staff development and in-service activities, and coordinate in the development of K-12 programs. f) Orient newly assigned staff and assist in their development as individually appropriate. 3. 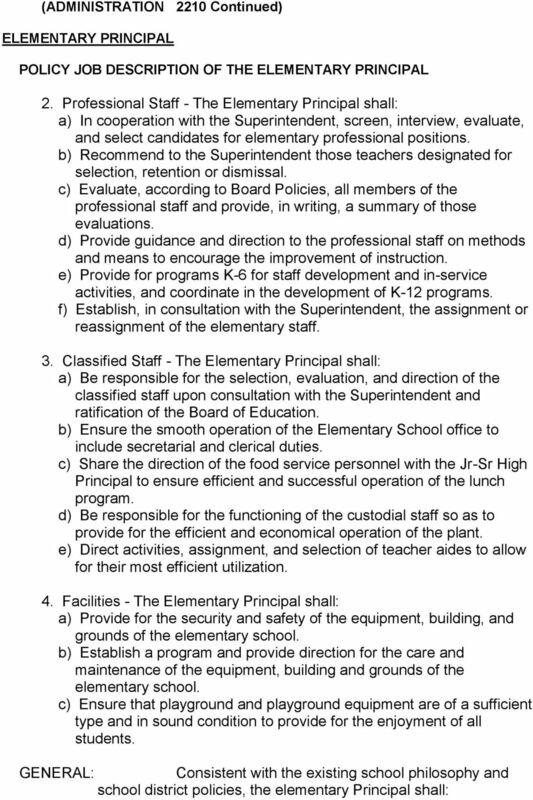 Classified Staff - The Secondary Principal shall: a) Be responsible for the selection, evaluation, and direction of the classified staff upon consultation with the Superintendent and ratification of the Board of Education. 16 b) Ensure the smooth operation of the Secondary School office to include secretarial and clerical duties. c) Share the direction of the food service personnel with the Elementary Principal to ensure efficient and successful operation of the lunch program. d) Be responsible for the functioning of the custodial staff so as to provide for the efficient and economical operation of the plant. e) Direct activities, assignment, and selection of teacher aides to allow for their most efficient utilization. 4. Facilities - The Secondary Principal shall: a) Provide for the security and safety of the equipment, building, and grounds of the secondary school. b) Establish a program and provide direction for the care and maintenance of the equipment, building, and grounds of the secondary school. c) Be responsible for the scheduling of all utilization of secondary facilities during and after normal school hours. 5. Administration - The Secondary Principal shall: a) Provide leadership through staff planning for budgetary needs and assists the Superintendent in administering and monitoring budget allocations. b) Provide recommendations regarding facilities and building needs coordinated with the intent of the total educational program. c) Prepare and promptly submit for approval all federal and state reports requested. d) Cause to be maintained an accurate, continuous, and current inventory of all school supplies and equipment under the control of the Jr-Sr High School. e) Shall have direct supervision over the school guidance program and shall cause to be maintained accurate and complete assessment of the total student and to provide for security and confidentiality of such records. 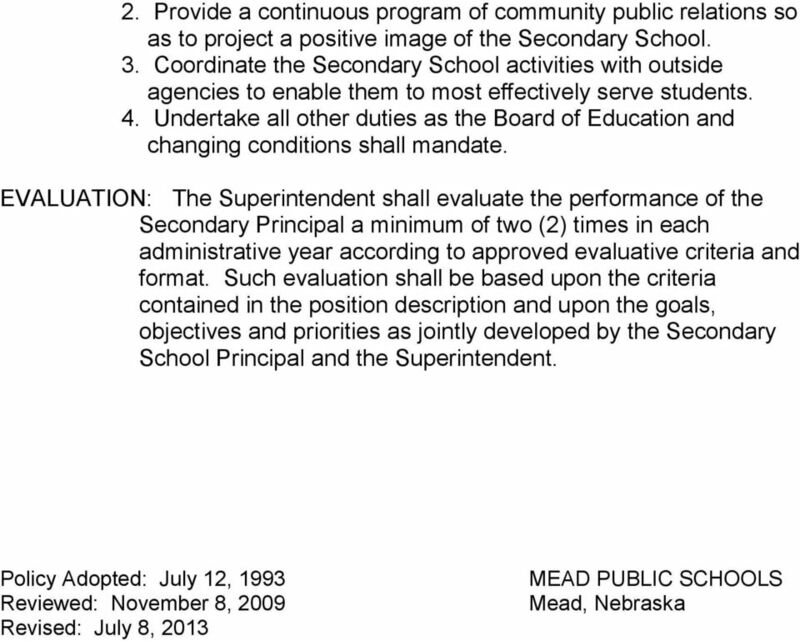 GENERAL: Consistent with the existing school philosophy and school district policies, the Secondary Principal shall: 1. Shall establish and maintain favorable relationships with local community groups and individuals to foster understanding and solicit support for overall school objectives and programs; to interpret board policies and administrative directives; and to discuss and resolve individual student problems. 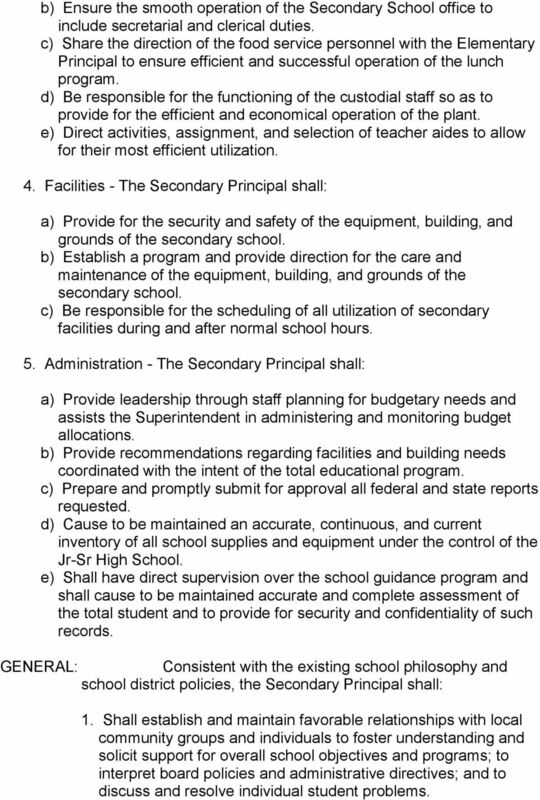 SECTION C GENERAL SCHOOL ADMINISTRATION Section C provides a repository for statements about the school district management, the administrative structure, school building, and department administration. The Assistant Director of Public Information shall be responsible to the Director of Public Information for the performance of all duties. JOB DESCRIPTION. Clinical Nurse Manager 2 (CNM2) Staff Nurses, Health Care Assistants, Administration staff, Student Nurses and all hospital staff. OPP CITY SCHOOLS JOB DESCRIPTION. (1) Master s degree from an accredited educational institution. To help improve the educational experience and general wellbeing of those students who are unable to profit from the existing school program. A. Certified school instructor means a teacher or instructional support provider. 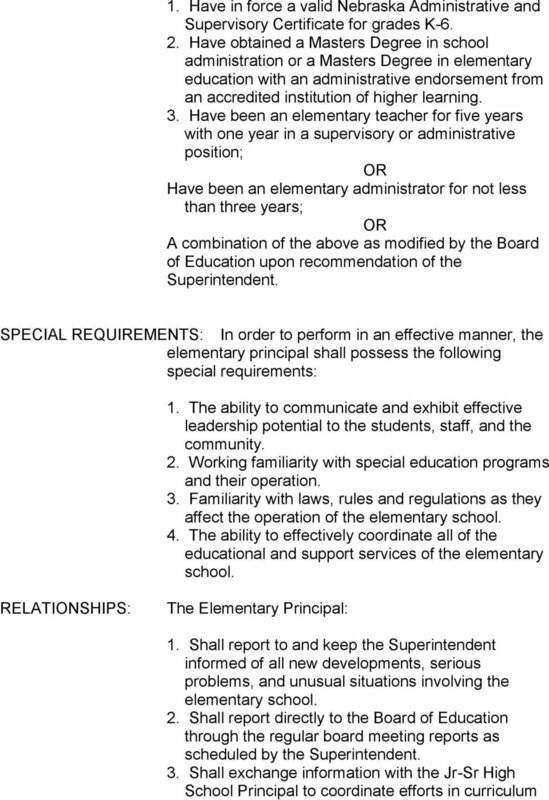 8.4 SCHOOL PERSONNEL Definitions A. Certified school instructor means a teacher or instructional support provider. B. Certified school employee or certified school personnel means a licensed school employee. GENERAL ASSEMBLY OF NORTH CAROLINA SESSION 2015 HOUSE BILL 1080 RATIFIED BILL AN ACT TO ESTABLISH THE ACHIEVEMENT SCHOOL DISTRICT.